Continuing to check things off from the blueprint. Did some ZBFW labbing today. Here are some important stuff to be aware of. ZBFW is basically a wrapper for CBAC. We create policys between zones and assign interfaces to zones instead of applying CBAC rules to interfaces. By default all traffic to the self zone will be allowed (router from and to router itself). If we apply policys to self zone then everything is dropped except for the traffic that is explicitly permitted. We need to be aware of this to not mess with the routing if we get such a task at the lab. The self zone can only inspect TCP, UDP and ICMP but not protocols like telnet and SSH. To work around this we can do a class-map matching an ACL AND the protocol TCP if we are matching telnet traffic. It’s not very intuitive to see which traffic is dropped. We can turn on logging with ip inspect log drop-pkt. This helps a lot to see which traffic is being dropped. ZBFW is massive in configuration, you will be typing a lot. It is easy to get confused and mix things. Name things intuitively, name class-maps CM_INSIDE_PROTOCOLS, name policy-maps PM_INSIDE_TO_OUTSIDE or names similar to that. If you don’t you will easily get lost after a while due to the massive config. Packet counters for ZBFW can’t be trusted, this seems to be due to a bug. Verify by pinging or telneting to create traffic. Use Notepad when creating the config, it is faster and less prone to errors. All traffic flows are unidirectional so we need to create zone pairs for both directions depending if we want traffic to flow both ways. We can have three different actions for traffic in the policy-maps. Inspect – Allow traffic through and also allow the return traffic back. If we have a policy-map that allows some traffic through, the rest of the traffic not matching any class will be implicitly dropped, this is even if we don’t specify a class class-default. That are the most important things you need to be aware of when configuring this feature. AAA new-model – What does it do? To enable AAA we need the AAA new-model command but what does it really do? Many of us makes assumptions about this command. By default if we have an empty config then we will be able to use the console and get straight into enable mode (priv15). If we try to telnet in (VTY) then we can’t login since no password has been set. If we set a password then we can login to priv 1 but we won’t be able to enable since no enable password has been set. When configuring AAA we use method lists. We can use the list called ‘default’ or create our own. The sneaky thing about aaa new-model is that when we enable this the ‘default’ list goes active which is applied to the VTY. What surprised me is that this is not applied to the console. Someone had a theory that Cisco wanted to apply it to both console and VTY but too many users got locked out of their routers so they had to back on this implementation, true or not, I don’t know. When aaa new-model has been enabled the device will ask for local authentication. If we haven’t defined any users then no access for you (VTY-nazi). Console will still work though, we will have to enable to enter priv 15 as usual. Now if we define a user we will be able to login remotely as well, we do need to configure an enable password to get into priv 15 though. How would you configure this, what do you do in real life? Post in comments. I’m going through the blueprint and now I checked off IP accounting. The feature is very simple, it lets us see which source destination pairs that are sending traffic to each other. We can also configure to look what precedence values that are in the packets. There is also an option to look at the MAC-addresses of the packets passing through and also packets that are being denied by an access-list. The topology is dead simple, see below. Configure your routing protocol of choice to get reachability. I’m using OSPF, it does not matter at all as long as you have connectivity. Now lets say that we are interested in which source and destination pairs that are sending traffic THROUGH the router (transit). Packets destined TO the router will not be seen in the accounting. I’ll configure accounting on R2’s interface to R1 and then initiate a ping from R1 to R3. I’ll send traffic both to the loopback and R3’s FastEthernet interface to see two different source/destination pairs. Now we will check the accounting database with the show ip accounting command. So that shows us what sources/destinations are sending traffic to each other, interesting! We can also see the number of packets and number of bytes. If we want to check statistics for only certain hosts we can use the global ip accounting-list command to define what hosts we are interested in. We define hosts/networks as in ACL with network/wilcard combination. Storing entries in the IP accounting database requires some memory, there could be a risk of exhaustion if we have too many entries but the default is set to max 512 entries. We can define this with the global ip accounting-threshold command. So now we want to check what IP precedence values pass through our interfaces and also what MAC addresses that are sending/receiving traffic. Lets configure this. Then we send some pings from R1, I will send with a ToS of 128, what IP precedence/DSCP is that? Think quick. Lets verify at R2 if we see anything, the command to use is show interface precedence. So a ToS of 128 was a IP prec of 4 but you already figured that, right? 🙂 What is that traffic with IP prec 6? Mysterious…We are running routing so that is OSPF which is marked with an IP precedence of 6 automatically by the router itself. We can also check what MAC addresses have been learned. Here we also see OSPF represented by the MAC address 01-00-5E-00-00-05. We can also see when the last packet was sent which is quite handy. Now we will turn on accounting for access-lists as well, first we will define an ACL denying ICMP to 3.3.3.3 which is the loopback of R3. Note that we need the log keyword in the ACL. Now we send traffic from R1 to 3.3.3.3. For some reason I don’t see anything with the show ip accounting access-violations. Maybe this is a software issue? I tried turning off CEF as well. If any of my readers get this working I would be interested. 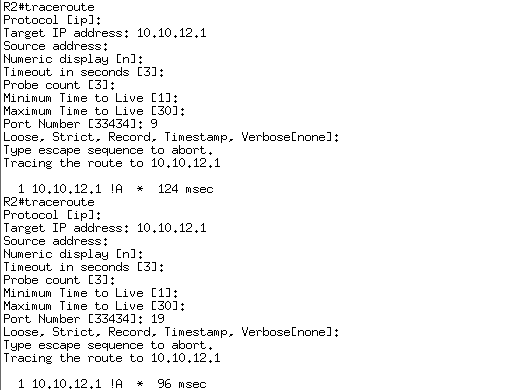 Lastly lets have a brief look at how traceroute works in IOS. Cisco devices uses UDP traceroute compared to ICMP used by Windows. The router sends packets with TTL of 1 and then N+1 the further away the probe goes. Traceroute sends three packets for every hop. The first hop will have a destination port of 33435, the second one will have 33436 and so on. If we want a router to not respond to traceroute we can turn off IP unreachables. Note that this will not hinder traceroute for which this router is not the final destination. 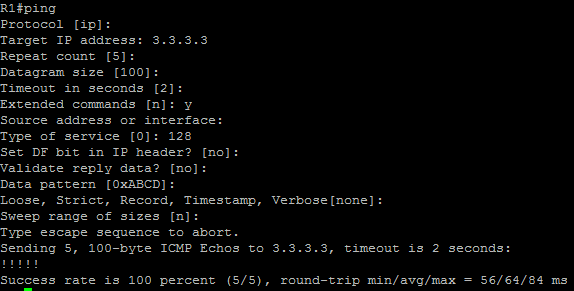 Only the final device will send an ICMP unreachable (port unreachable) which is ICMP code 3. The other routers will send time exceeded which is ICMP code 11. If we did want to block traceroute going through the router we could block this with an ACL denying packets that have ttl-exceeded or all packets lower than a certain TTL. If we need to find ICMP codes we can reference the ASA library. This should be available at the lab. You can find the reference by following this path. So this is just another feature that is handy to have. Assume that the Tacacs+ servers are unavailable. What will be the result and what is the difference between scenario 1 and 2? Post your answer in comments.